Kopan Monastery, Nepal.Lama Zopa Rinpoche established the Stupa Fund in 1992 with the aim of providing the resources needed for building 100,000 stupas around the world, each a minimum height of 12 feet. Simply seeing a holy object such as a stupa becomes the cause to achieve inconceivable awakening and enlightenment by purifying defilements. This is the special advantage of holy objects, that just by their existence they make it so easy for all living beings to create merit. And many other stupas in Nepal, Spain, Italy, France, the United States, Canada, Iceland, Tibet, Australia, and New Zealand. 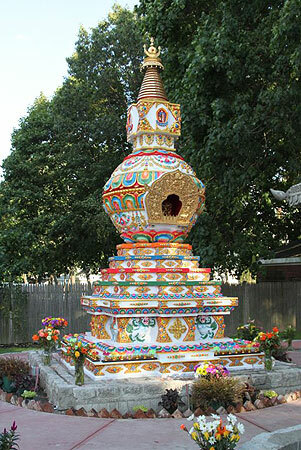 Gallery of some of the stupas inspired by Lama Zopa Rinpoche. 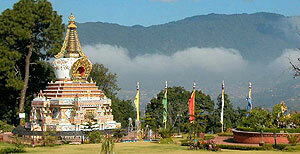 We have created a page dedicated to documenting the incredible stupas being built around the world! Please rejoice and enjoy! Lama Zopa Rinpoche translated “Padmasambhava’s Instruction on Offerings to Stupas,” which details the benefits of prostrating to, circumambulating, making offerings, and offering service to stupas. You can learn more about stupas in this online collection, Stupas: a Resource Guide. “Stupas in Everyday Life,” advice from Lama Zopa Rinpoche. “Notable FPMT Holy Objects Around the World,” from Mandala magazine, April-June 2010. Or simply send your check in US dollars payable to FPMT Inc. and write “Stupa Fund” on the memo line.